On Wednesday the Coalition announced a pledge to upgrade all the main regional rail lines to 200 km/h, cutting travel times. This is a really interesting policy. 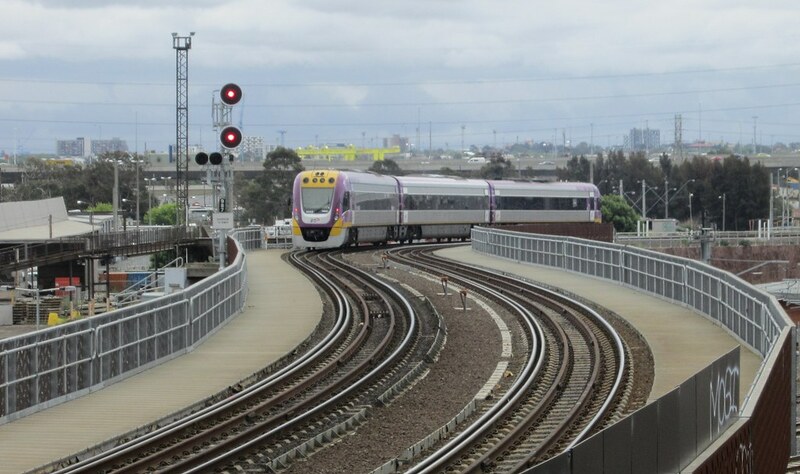 Given the ALP has pledged to investigate fast rail to Geelong, and is upgrading other lines, it’s great to see both sides talking about regional rail. The talk from the Coalition is of “European-style” high speed rail. I’m not sure that analogy stacks up. The Europeans are running electrified trains at 250-320 km/h, not diesel trains at 200. The plan is closer to the British main line railways with their large fleet of diesel-powered InterCity 125s (eg 125 mph = 200 km/h). However these were developed in the 1970s (with swing doors!) and many (but not all) are starting to be phased out as part of a huge upgrade, in favour of electric or bimodal trains on the main lines. In fact in a lot of the world, high speed rail is not a term applied to trains that run at 200 km/h — this is known as “higher-speed rail“! The other important aspect of European high speed rail is a good network of local services connecting high speed rail services to the suburbs of regional cities — this is something both sides of politics aren’t really talking about. For rail services to rely purely on walk-up catchments and Park And Ride is severely limiting patronage. Apart from proposed running times, the Coalition are a little vague on details of a service plan. Perhaps fair enough not to get into too many specifics without some detailed planning, though it’d be good to have a rough idea of what they have in mind. The current mostly hourly off-peak service doesn’t cut it. The plan does specify hourly trains between Colac and Bannockburn (I admit I had to look it up; it’s northwest of Geelong on the line to Ballarat), and from Waurn Ponds to Werribee. That would make for a combined frequency of half-hourly between Waurn Ponds and Geelong, alongside the main service to Melbourne. This is a clever idea, with a lot of potential, though the Werribee service could be more frequent if it’s going to attract people out of cars along the Princes Highway. A short term change flagged is more express trains between Geelong and Melbourne, to immediately cut travel times down to 50 minutes. In fact, the 17:33 weekday departure out of Southern Cross already does this trip in 50 minutes, scheduled to arrive in Geelong at 18:23. Running more trains at this speed is possible, but difficult. You’d need to change stopping patterns around to make way for the expresses, which could lead to long waits and crowding at intermediate stations. It would also further complicate the timetable, which already has an incredible 16 different stopping patterns in just the morning inbound services before 10am. More consistency would help cut delays and even out train loads. After my UK trip last year, I thought upgrades to get Victoria’s main lines to 200 km/h would be a great idea. After all, the Brits did it in the 1970s. How hard could it be? Turns out it’s difficult — you need a new fleet, the V/Locities can’t do it. It would also be wise to remove most level crossings, though it may not be absolutely necessary to remove the quietest/low-risk crossings. So the next question is: if you’re going to spend tens of billions on new fleets and rebuilding track, shouldn’t you be aiming a little higher than 200, up from 160? What about 250 or 300? This would require total grade separation, but for the money, would make a bigger difference to speed. Or is 200 too fast? Alternatively… it strikes me that in terms of bang per buck, if we’re not aiming for a top speed of well above 200, a better option would be to institute upgrades that help the V/Locity trains reach their full potential. And definitely run more trains across the day, not just in peak hour — at least every half-hour all day, every day, if not more frequent. I’m betting all that would be a lot cheaper than $19 billion, and would bring huge benefits to overall travel times — in particular cutting delays and waiting times (especially to/from connecting services). Amazingly, according to remarks in this video (go to 8 minutes in), the Coalition plan appears not to include full duplication of the Ballarat line, just “a slight extension of some of the passing loops on the western side of Bacchus Marsh”. 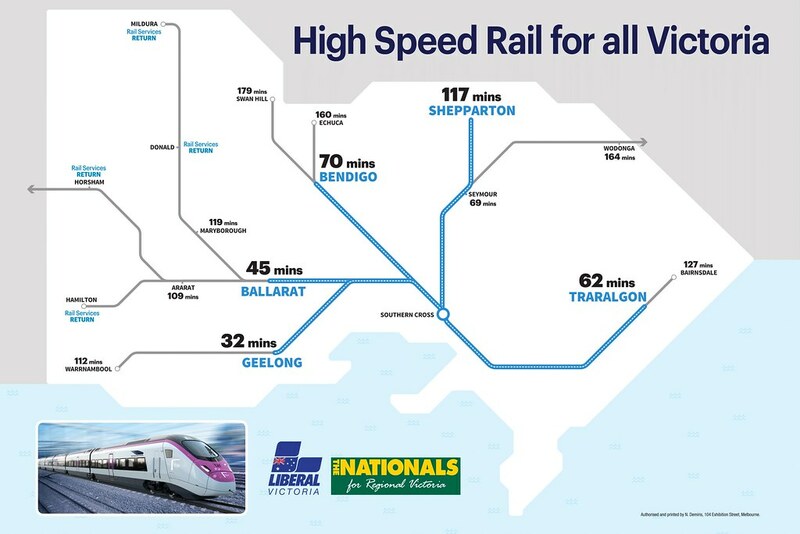 This shows that — just as Labor did last decade with the disastrous singling of the Bendigo line — they’ve focused far more on speed and travel time, at the expense of frequency and reliability. Predictably, Labor has savaged the Coalition’s proposal for its lack of detail. It’s clearly a very ambitious plan: Geelong fully upgraded by 2022, the rest by 2028. Is it possible? There’s an awful lot of cynicism about it, but at least the Coalition is thinking big. Driving the overall policy is the Coalition aim of help decentralise Victoria’s population, which makes a lot of sense. I don’t have all the answers, but it’s a great discussion to have, and it’s terrific to see both sides being ambitious around public transport. 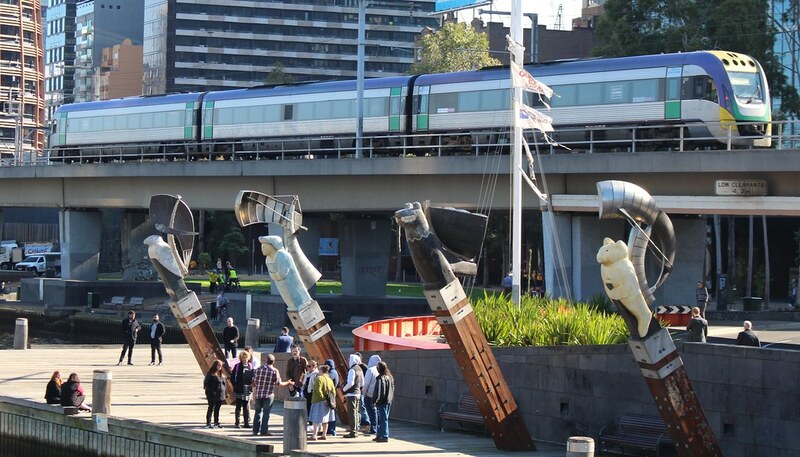 Southern Cross to outside the CBD is easy – just build the whole darn thing underground. If the Chinese can do it from Shenzhen to Hong Kong with their new rail link, why can’t we? A time saving of 20 minutes is great, but not if you waited half an hour for the train. Good to see a focus on improved services for the country, but this seems designed to win headlines more than offering genuine improvements. TL;DR: pretty much what you said here, Daniel. Seems like a silly proposal from the Coalition; a RFR part 2 if you like. I’d prefer $19 billion dollars spent on Metro 2, as this will have state-wide benefits. With Metro 2 and MARL incorporating both Metro and V/line trains, every line apart from the Traralgon line would be separated from Metro services (excluding airport services which shouldn’t pose great reliability issues). Once that is complete, then extending V/line services further out and increasing speed is more viable. Just to get the existing trains up to 160 km/h for most of their journeys would make a huge difference. If billions are to be spent on regional rail, it may as well be done properly and future proofed with trains travelling at speeds we are jealously seeing in China. Until they propose in some detail how they’ll get trains from Southern Cross to Traralgon in 62 minutes, I’m filing the whole thing under pre-election fantasy land ‘promises’. Southern Cross to Geelong in 32 minutes! Presumably that’s the time for an express, which at the moment could be done in, say, 47 minutes (the 5.33 express stops at Footscray, Sunshine and North Geelong according to the timetable). On travel time more generally, it’s 12 minutes from Southern Cross to Sunshine and 16 minutes from Lara to Geelong (stopping all stations) – there’s 28 minutes of your journey – so improvements in travel time need to cut significantly there – and 33 minutes between Sunshine and Lara – if you could increase speed on that portion by 25%, you could save about 8 minutes on that bit. Just on the 5.33 express (which I often see pulling into Geelong while I wait for my train back to Melbourne), it comes straight after the Warrnambool service, which runs express only to Lara. If V/Line could run an express V/Locity at that time, there could be two super expresses within 10 minutes. I think you’d really need dedicated tracks through Geelong to run express services more often, and other services to stop at the intermediate stations – but if intermediate services only run to Wyndham Vale or Werribee, you might expect more people to want to travel from Geelong for the convenience. It all seems very ambitious. This does come from the party that pledged to build Southland Station – which involved no track construction, merely two platforms and a tunnel under the tracks, and failed to even begin construction in their four year term. Libs also descoped RRL by $1bn when they assumed office and pumped most of it into rural roads. As much as I personally really want this project to happen I just don’t have any faith in the state Coalition building a Public Transport project as large as this scale in the 21st Century. Yes I know they built the city loop and improved PT frequencies but if you think about the state Coalitions previous history in building large scale projects we haven’t seen anything of such during the Kennett era or the Bailleu/Napthine era. Not saying Labor is the best either but at least Labor has a proven record in delivering large scale public transport projects as the Coalition particular during the Bailleu/Napthine era did virtually nothing. Let’s not forget their broken promises in the 2010 election when it came to Public Transport projects. By the way this is not an endorsement of Labor or a trashing of the Liberals as I don’t support either party. This is just a view from someone who has seen the record of both parties. Hopefully I can be proven wrong. 32 minute trains to Geelong by 2022? The Liberal’s policy seems unrealistic. A more reasonable target would be 40 minutes to Geelong by 2026, with an express service every 15 minutes during peak periods. 1. Build a new track pair between Sunshine and Wyndham Vale (designed to accommodate 200km/h trains in the future). 2. Electrify existing track (adding at least 2 existing stops). 3. Regional Trains trains to run on new tracks for the Airport Line (also designed for higher speed operations). Wyndham Vale / Melton trains to use existing RRL track. 3. Geelong Trains to only stop at Wyndham Vale and Sunshine. 4.. Incremental improvements to the track between Geelong and Wyndham Vale, to increase average speed by 10 – 20 km/h. There’s planning on the back of an envelope, and then there’s planning on the back of a beer coaster after a few pints at the Melbourne Club. This seems to be the latter. A price of $10 billion is high relative to the modest absorption capacity of the regional cities. While Melbourne’s growth rate is 123,000 per year, it is only 2.5% of the existing population per year, so services are sort of coping. Compare that with say Ballarat, which currently has a population of 100,000, so a growth rate of 2.5% would only accommodate 2,500 new residents per year. Add in Geelong, Warrnambool, Bendigo, Shepparton, Wodonga and the Latrobe Valley at a 2.5% growth rate and it still only accommodates 16,000 per year, which would relieve Melbourne of only 13% of its growth. Higher growth rates would cause a lot of traffic problems in regional cities, because they have car-based transport systems with poor public transport networks. The key to housing this growth is allowing higher density in the Melbourne middle ring suburbs where previous government investment has provided good public transport networks. One street I am familiar with in East Malvern is zoned for single family residences. As the 1930’s bungalows are torn down, they are replaced by 2-storey single-family McMansions that utilise most of the site and appear to be bought by overseas Chinese as trophy homes. These large houses are much more imposing than a 2-storey 1970’s apartment block which is also in the street, which consists of with 12 x 3-bedroom apartments. The “save our suburbs” push that led to single-residence zoning is backfiring. The suburb is changing anyway with new buildings and a new wave of residents who are unrelated to those who lobbied for single-family zoning. Meanwhile the children of those who lobbied are forced to the outer suburbs where every adult needs a car. If only we had allowed multi-family accommodation on this well-serviced land, more of our own children would be able to afford to live in the desirable inner suburbs rather than a few overseas Chinese who would probably drive the few times they come.